In my teenage years, Vanilla was my fragrance of choice. I remember how delighted I was when my mum bought me Vanilla Dream aerosol body spray by Aussie brand Australis when I was 13. In hindsight, this stuff smelled beyond revolting but it started the ball rolling for my love affair with all things sweet. In my early twenties I moved on to the somewhat more refined Vanilla Perfume Oil by The Body Shop and the little glass bottle remained a handbag staple for a long time. Fast forward a few years and here I am, on the other side of the world browsing The Body Shop shelves on my lunch break eyeing up the new line of body mists and feeling a jolt of nostalgia when I notice the iconic vanilla scent I once adored is available in the range. The Body Mists are £7 at The Body Shop. 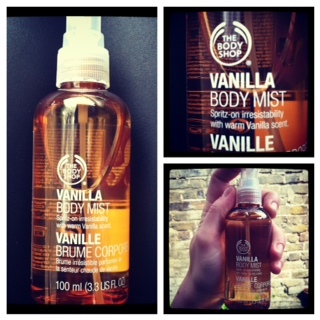 Just like the original perfume oil, the body mist delivers a sweet burst of warm, true vanilla fragrance. Unexpectedly, the scent lingers on the skin for quite a long time, though it seems to dull down to a more subtle fragrance as the day wears on. The mist is alcohol based rather than oil based so it's ideal for spritzing on hair to freshen up locks without the risk of giving yourself greasy roots! What do you think about the mists? Have you tried them out yet? Hey thanks for stopping by and following my blog! I love vanilla smells as well :) Now a new follower! I like Vanilla, so i will try this out :) I love your blog by the way. AH vanilla is my favourite scent. I love it when it dies down to a really subtle smell, makes me feel homely.